Mike Goff was a reliever for the San Bernardino Spirit in 1989 but he could also start. Either way, Goff hoped the Mariners would need one and he would be the one to do it, he told The San Bernardino County Sun. "If I get into a jam as a starter, I would have the experience to work my way out of it," Goff told The Sun. "But now I have to concentrate on what I'm doing here in San Bernardino. If Seattle needs a stopper down the road, I'll be around." Goff ended up saving seventeen games for the Spirit that year. He also ended up playing in just one more season. He never made the majors. 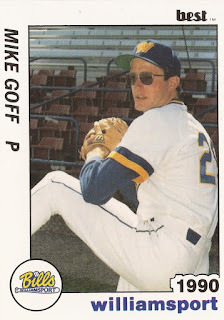 Goff's career began in 1987, taken by the Mariners in the third round out of Fresno State. At Fresno State, Goff played on the 1986 U.S World Championships team. He picked up a complete-game win in March 1985. With the Mariners, Goff started at short-season Bellingham. In 13 starts, he went 5-6, with a 7.31 ERA. Pushing that ERA up was a July outing where he was charged with 10 runs in just two innings of work. In August, though, Goff went seven innings and gave up just one run for the win. Goff played 1988 mostly at single-A Wausau, with a few games at San Bernardino. He also moved to relieving. In 58 total outings, Goff had a 3.86 ERA and 18 saves. He played 1989 mostly at San Bernardino, but he also briefly made Williamsport. He had eight outings at Williamsport, giving up six earned in 14 innings of work. Goff came back for 1990, but his season was brief. He got three outings at San Bernardino and two at Williamsport. They were the last outings of his professional career.